Have You Seen These Data On Failure To Rescue? 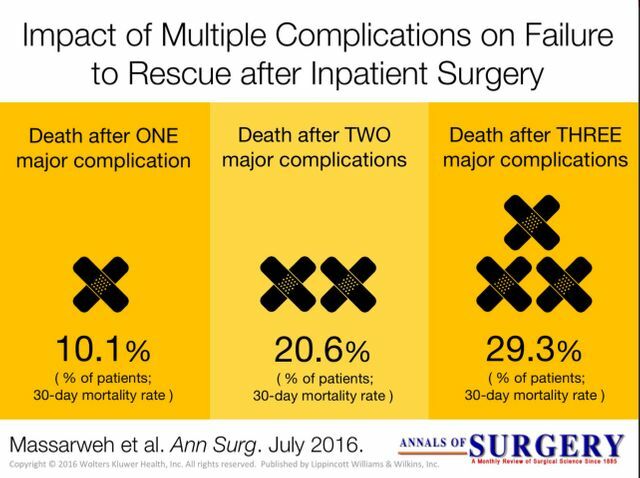 It's probably no surprise that patients with more complications generally do worse and are tougher to salvage when things go wrong...but, that said, here's a unique paper (and visual abstract) that highlight how more complications (up to three or more) correlate with increased Failure To Rescue (FTR). So, with work like this, take a moment to look beyond the abstract and decide if the model adjusts for the level of patient disease at the onset. All of that said, this work interestingly highlights how Failure To Rescue is more likely in patients with more than one complication. Watch out for that group for sure! More on FTR, this time from the NHS, in a fascinating piece here. Click the link below for the abstract of Massarweh et al 's paper in Annals of Surgery, and note that the visual abstract beneath is their work as well. Citations as beneath! FTR [Failure To Rescue] occurs predominantly among patients who have more than 1 complication with a dose-response relationship as complications accrue. As this dose-response relationship is observed across hospitals, surgical quality improvement efforts may benefit by shifting focus to broader interventions designed to prevent subsequent complications at all hospitals.